New York Charter Bus Company has served the New York City and tri-state area for years and is a leading provider of charter bus, motorcoach and minibus rentals. We book buses for groups and events of all shapes and sizes: from weddings, sporting events, field trips, corporate retreats and more. We have reservation specialists available 24/7 to review your itinerary, provide a quote and help you reserve the perfect coach bus for your trip. Call 917-388-9602 anytime for a free quote and let us help with your trip. No matter where you’re going or the size of your group, NYC Charter Bus Company is fully prepared to help make your group transportation easy and stress-free. With access to a wide range of bus rentals, from 18-passenger minibuses all the way to full-sized coaches that carry 56 passengers, we can always match you with the perfect bus at the best price. We’re available 24/7 to help plan your trip in New York City! Coaches, athletes, staff members, and dedicated fans all rely on NYC Charter Bus Company to get them to their next game or tailgate in comfort and style. With plenty of storage space and premium amenities like reclining seats, flat screen TVs, WiFi, and more, your group will be fully prepared to win their next match. Planning wedding transportation is simple when you work with NYC Charter Bus Company. We make transporting wedding guests and your whole wedding party easy. On your big day, we understand how important it is to stay organized, which is why we ensure your whole day is stress-free as possible with reliable, modern buses and 24/7 customer service. NYC Charter Bus Company understands how important it is to stay on schedule for important corporate events. Don’t rely on public transportation and rideshare apps for transporting big groups when you can rent a charter bus for optimal organization and time management. Give us your itinerary, and we’ll handle the parking, navigation, and traffic for you! Students and chaperones deserve the trip of their lives in a modern, reliable charter bus. We only work with licensed, professional drivers, and all buses we reserve are required to pass numerous inspections. NYC Charter Bus Company will work hard to match you and your students with the perfect bus to ensure their trip is comfortable, safe, and fun. If you're planning a private event trip to New York City and considering a charter bus rental for transportation, NYC Charter Bus Company has you covered. From event navigation, travel schedules, and parking a private driver will show you the way through the Big Apple. Charter buses are the most spacious bus rentals available, perfect for larger groups traveling long distances. Charter buses can come fully-equipped with top-notch amenities such as reclining seats, on-board restrooms, WiFi, flat screen TVs, DVD players, and more.  No matter where you’re going, you can rest assured you’ll have the most modern, reliable charter bus in NYC. Minibuses come in a variety of sizes, making them ideal for smaller groups traveling within the city. Minibuses are the perfect, cost-effective alternative to public transportation and rideshare apps. They offer a wide variety of premium amenities, like flat screen TVs, WiFi, power outlets, overhead storage bins, and more to provide you with a secure and comfortable trip. New York City may be the City That Never Sleeps, but that doesn’t mean that planning your next NYC getaway should make you toss and turn at night. Rest easy knowing that New York Charter Bus Company has your back. 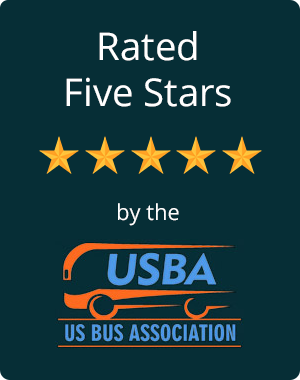 Countless passengers consider us the top provider for sight-seeing transportation in and around the Big Apple, and for good reason. We’ll set up your tour group with a professional and punctual driver, so you don’t risk losing anyone to the hectic foot traffic, a complex subway system, or a sea of identical taxicabs. Whether you’re here to peruse the blocks upon blocks of shops, receive a serenade and a selfie from the Naked Cowboy, or just take it all in, Time Square is infamous for entrancing visitors with its bright lights and bustling vibe. Understandably, traffic around this NYC hotspot is hectic, so consider having your driver drop off your group at the edges of Midtown or Hell’s Kitchen to avoid the worst of it. Taking on the entirety of this district can take a toll on your feet, but trust us, the prime window-shopping and people-watching are worth experiencing on street level. Just be mindful of where to chill and where to book it. No one likes an inconsiderate pedestrian. We know, we know. You’ve probably seen Central Park a million times in your favorite movies and TV shows, from 27 Dresses to Home Alone 2, from 30 Rock and Broad City. But trust us, you’ll want to see all 840 acres of this NYC landmark in-person. From posing for photos in front of the Balto sculpture, to paying respects at Strawberry Fields, to soaking in the sun at the edge of the Bethesda fountain, this iconic park offers no shortage of activities for tour groups who are eager to stretch their legs. 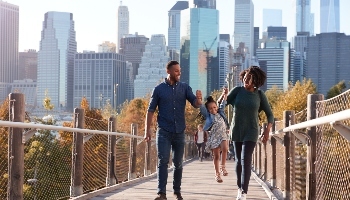 It takes about an hour to cross this mile-long walkway over the East River, especially if you stop to enjoy the view, so be sure to give your group plenty of time to take it all in. If you’re coming in from Manhattan, your driver should drop you off at the northeastern corner of City Hall Park. Those crossing from the Brooklyn side should meet on the corner of Tillary and Adams. There’s no tolls for the automobiles rumbling away underfoot, so save your group— and your feet— the trouble of the return trip by having your driver meet you on the other side, ready to whisk everyone to the next stop on your itinerary. The ghost of a marsh and a cemetery. A chess master’s battleground. The Grand Central Station for protestors, dog-walkers, and fountain-splashers. These are just some of the titles bestowed upon this beloved NYC landmark. Whether you’re basking in the shadow of the Washington Square Arch or wandering through the trendy boutiques and restaurants along its perimeter, WSP is the perfect place to catch your breath before your group takes on the rest of Greenwich Village. Three floors. A collection of rare and out-of-circulation editions. Over 2.5 million—yes, million— titles. Need we say more? Come visit this oft-overlooked hidden gem of the Village: the last remaining shop from the district’s historical Book Row. Whether you’re in the market for a well-loved classic or a specific square-footage of beautifully bound tomes, this shop has enough charm to fill even the pickiest of book snobs with unabashed, child-like wonder. Did you honestly think we’d bypass this New York City icon? Of course not, and neither should you! Making the most of the Empire State Building, however, is not for the faint of heart. For bold sight-seers willing to brave the 102-story climb to the building’s peak, you’ll be met with some of the most unforgettable, panoramic views of Manhattan and— on a clear day— the surrounding 80 miles of land and sea. For many first-time visitors, the culture shock here can be intimidating. Embrace it! Grab some street food— we recommend the fried noodle cart on Centre Street; it’s authentic, delicious, and extremely cheap— and enjoy your meal in Columbus Park amid the waves of local checkers champions, Tai Chi savants, and other passersby that make up the life of this thriving neighborhood. If you’re feeling especially adventurous, sit in on a service and pick up a fortune at Temple Mahayana, the east coast’s oldest Buddhist temple, or wander through Chinatown’s local-frequented open air markets, groceries, and butchers. 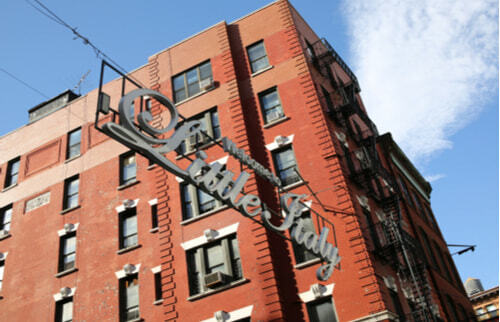 Explore all the culture and cuisine of traditional Italy without ever leaving lower Manhattan! Don’t let its mere 3-block span fool you; this neighborhood is dense. So dense, in fact, we recommend spanning your experiences here over several days to avoid a stomach ache or cannoli overload. However, visitors itching for a concentrated dose of Italia via live music, parades, and carb-filled foods galore should not shy away from the Feast of San Gennaro— the locals sure don’t. No, a charter bus can’t take you to the foot of this iconic NYC fixture quite like the Statue Cruise ferry. We can, however, get you to The Battery docks with plenty of time to organize your tickets, clear the security gate, and grab your audio tour materials before you board. Even better, your driver can look after whatever belongings you leave on the bus, so you can explore the statue and Ellis Island unencumbered. Each borough in New York City has its own unique flair and roster of entertainment, attractions, and activities. 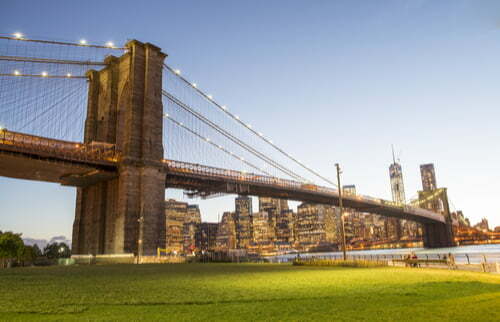 New York City Charter Bus Company services every borough, as well as the surrounding areas. Easily travel throughout the boroughs in your own private charter bus or minibus. When someone says “The Big Apple”, they’re usually referring to the borough of Manhattan. It is the most densely populated borough and is home to world-renowned museums and attractions like Times Square, Central Park, the Empire State Building, and the Met. 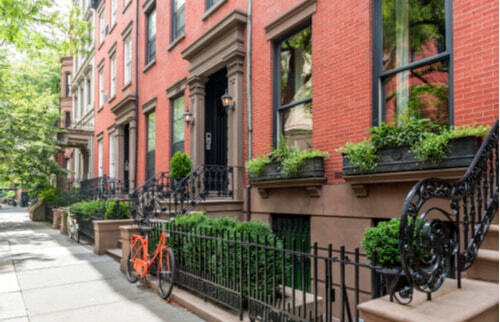 Along with plenty of tourist hotspots, Manhattan is home to iconic neighborhoods like Chelsea, Greenwich Village, and Tribeca. Located on Long Island across the East River and landmark Brooklyn Bridge, this diverse borough has the highest population among the five. Brooklyn is a major hub for independent arts and has become a haven for creatives in modern times. Well-known neighborhood Coney Island is located in Brooklyn, along with other popular areas like DUMBO, Bushwick, and Williamsburg. Queens is located just east of Brooklyn on Long Island and is regarded as one of the most ethnically diverse neighborhoods in the country. Popular among families and a primarily residential borough, Queens may not have the hustle of Manhattan or the artistic atmosphere of Brooklyn, but it is loved among its residents. Grab delicious Greek food in Astoria or head over to Flushing to support the Mets at Citi Field. With its rich culture and several historic claims to fame, The Bronx is steadily becoming a rising borough. The Bronx is hailed as the “cradle of hip hop and rap,” giving way to a 1970s cultural movement that’s still being felt today. 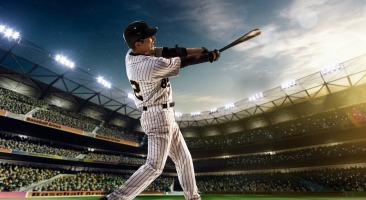 The famed New York Yankees also call The Bronx home, with Yankee Stadium being located in the Concourse neighborhood off of the Harlem River. Although Staten Island is the biggest borough by land size, this area has the smallest population among the five. Staten Island is located across the New York Bay from Manhattan and is generally filled with residential neighborhoods, perfect for families and groups looking for a calm visit. Traveling from Staten Island offers views of the Statue of Liberty and historic Ellis Island. 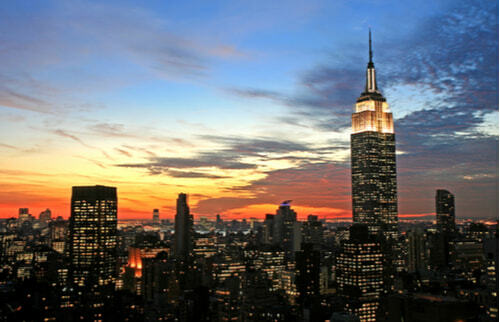 Take a bite out of the Big Apple with New York Charter Bus Company, your solution to group travel! Don’t settle or go out of your budget for transportation services that add to the hassle. Instead, invest in a modest coach model everyone can enjoy with TVs, WiFi, climate-controlled cabins, spacious interiors, and plush, reclining seats. Call one of our dedicated reservation specialists at (917) 388-9602 , and we’ll make sure the ride is an exciting part of your journey north! If your group is traveling to New York City from a nearby city like Albany or Newark, a private bus driver will be at your service so all passengers can be transported seamlessly through the city of dreams.